Pretty much every interior fan knows them: The Knot Cushions by Design House Stockholm. But who is behind this unusual design? We've asked the Icelandic designer Ragnheiður Ösp Sigurðardóttir for an interview. In addition to personal insights into her apartment, Ragnheiður tells us what tips she has for young designers and why pink goes over everything! You've only just moved into your new apartment in Reykjavik. What was especially important to you for your new home? We were pretty flexible, we had been looking for places around Reykjavík and even around Iceland. We knew we wanted a kitchen where two people could easily cook and I wanted a bathtub. We were lucky to find an apartment in the same neighbourhood we’ve lived in for the past four years. We have everything we need within range and my studio is only a five-minute drive away. Definitely the living room. It is what attracted us to the apartment in the first place. It’s big, open and bright with lovely, old floorboards that we got fixed. There’s a really nice atmosphere in it, I’ve even used it for teaching yoga. "I will probably never love any colour as much as I love pink!" "I spend a lot of time at home, you could say I’m a bit of a hermit. Home is my safety zone, it is where I relax and spend quality time with myself, my husband and my dog. Do you have something in your home that has a sentimental value for you? Yes, I have a few cute animal statues that used to belong to my mum, a desk from my grandfather, an old chair from my husband’s grandmother and a dresser my mum decorated for me just before I was born. These are things that a very dear to me. What interior trend do you currently like the most? I’ve been pretty obsessed with ceramics lately. I absolutely love Studio Ar hoj and their use of colours and texture. Earthy, raw ceramics mixed with creamy colours inspired by minerals and galaxies is something I want to fill my apartment with. Since we moved I’ve been buying a lot of plants, it’s such a nice and practical way to fill up space. And of course, you get to pick out a planter as well. Doing research and getting into a creative meditative flow. Also the flexibility and being able to work wherever I feel like. How did the collaboration between you and the brand design House Stockholm come about? Anders Färdig came to DesignMarch (an annual design festival in Reykjavík) in 2013 and saw my cushions. We stayed in contact for several years, trying to find the best way possible to produce the cushions. In 2016, they finally became part of the DHS range. What advice do you have for all young designers and students on the road to independence? For me starting small was key and building it up from there. Don’t be afraid to ask for help, finding good people to work with is priceless! Are there any other designers or artists that inspire you? I’m obsessed with crystals and minerals and have been a collector since I was a kid. My friend often mentions that nature is the best designer and I totally agree with that. I’m following a lot of mineral sellers and enthusiasts on Instagram and love seeing well photographed and stylized mineral photos. The artist Carly Waito is a big inspiration for me. She paints super-realistic paintings of crystals which basically look like photographs. They are absolutely amazing. You live in the heart of Iceland in Reykjavik. What are your favourite spots in and around the city you would recommend everybody who´s visiting? Most of my favourite spots are right in our neighbourhood. The Botanical Garden: gorgeous for picnics or walks. And Brauð og co: the best sourdough bread in Iceland. A visit to Viðey - an island outside of Reykjavik - is always enjoyable. In downtown Reykjavík, I really like visiting Kaffi Vínyl, a vegan restaurant/coffee house and going to concerts at Harpa concert hall. What was your best trip so far? I went to Japan in 2013 with my parents. We spent two weeks there and visited five cities. It was definitely a feast for all the senses and I’d love to go back someday. Dear Ragnheiður, thank you for the interview! 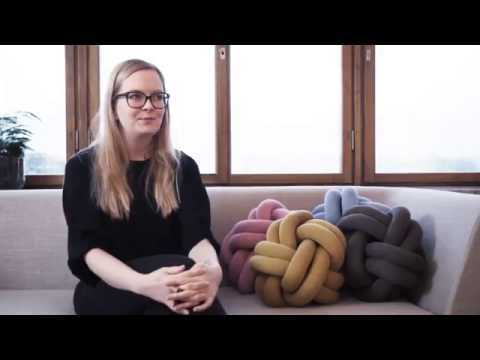 Learn more about the playful Knot cushion from the Icelandic designer Ragnheiður Ösp Sigurðardóttir and how the comfortable design for Design House Stockholm came into being.